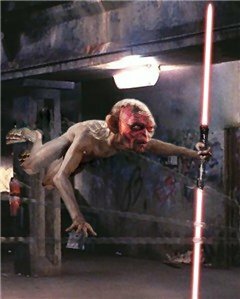 Gollum, do you like Star Wars? Do we like...Star Warses. We do, yes, we do likes it a bit. Not the Emperor. Not nice, no, not very nice. And "Ben" makes us think of the wizard, Gandalf. But we likes other parts. When The Clone Wars was on, we watched it. We even reviews it on the short blogger's blog! But between Star Warses and our movies, we likes ours better. Much better. We are in it! Is you went to the movies what would you take? We answers the first a bit before, but Baggins. We hates it forever. Never forgive it! Never forgive it for stealing our precious, our birthday present. Maybe we steals its pocket handkerchief! See how it likes having its precious stolen. Now that we thinks about it, we finds a picture of us in Star Warses! 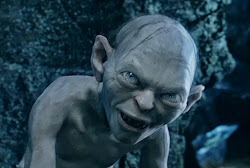 We thanks it for the questions, precious! Thanks for answering my question! And hilarious answer too. That picture of you in Star Wars is so funny, you could be Maul's half brother or something. Glad you like Star Wars, Gollum, it's definitely a favorite of mine. And I agree about movie theaters, I like the dark too. Vellvin - We doesn't mind. We likes to talk to it. Yes, very good films, very good precious! James - We are happy to answer its questions about us. Oh no precious, we would not want to be the brother of one of Maul's halfs. Strange, very strange.